Recently, I stumbled upon a forum discussion about the potential health hazards resulting from ingesting chia seeds. I was concerned because at Vegeliac we have several recipes containing chia, for example as an egg substitute. I decided to research this topic to see if this was true. In this article I will give a brief overview of chia seeds and I will summarize my findings regarding chia seeds side effects. Chia is a summer herbaceous plant of the mint family. It’s botanical name is Salvia Hispanica. 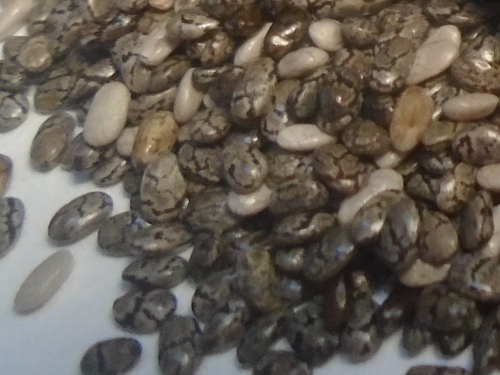 Chia seeds were part of the diet of some Pre-Hispanic civilizations, principally the Aztecs. Chia was used, among other things, as a raw material for making food, medicines and paints. One form of meal was called pinole. However, the most popular type of pinole is made from corn flour. Pinole is still in use today, at least the corn type. I remember my grand mother mixing a spoon of pinole with a glass of milk. It smelled like popcorn. Chia lemonade is nowadays a very popular drink in Mexico. Chia seeds are becoming very popular because of their great nutritional value. They are getting the attention of the food and diet industries. Chia is also used as a weight loss supplement. 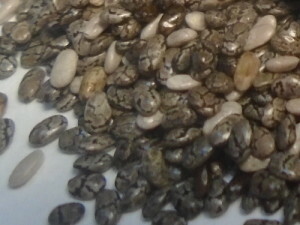 There is a growing interest in the food industry to use chia as a food ingredient, especially in the production of bread. I started researching the Internet. As you know, some times the web is not always a trusted source of information. Because everybody can publish whatever they please, it’s often the case that we find misleading information. Any way, I found some interesting articles on the web, but I wasn’t sure if I should trust them. So, I went ahead and searched for scholarly articles. Out of the 222 articles that I found related to chia seeds, only two of them where directly related to the safety of chia seeds consumption. The majority of the articles addressed the application of Salvia Hispanica to the improvement of medical conditions like diabetes, heart diseases, blood pressure and weight loss. Other articles discussed the use of the seeds in the production of bread and their effect in the quality of baked products. Most studies that involved intake of Salvia Hispanica seeds were performed in animals: rabbits, rats and broilers. Few of them where conducted in humans. I can infer from the existent scientific literature that more research is needed to evaluate the side effects of the intake of chia seeds. 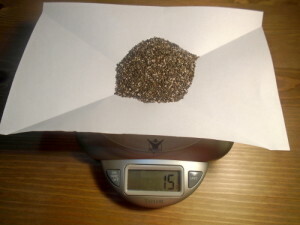 No evidence for an allergic or cross-allergenic response was found in countries where chia seeds are consumed, such as the USA, Canada, Australia and South America. However, because of possible cross-reaction in patients allergic to peanuts and sesame, it has been suggested to label products as inappropriate to individuals allergic to peanuts, sesame and mustard. Chia seeds are unlikely to be nutritional disadvantageous to consumers providing a reasonable amount of intake. Despite that the toxicological information on chia seeds from animal and controlled human studies is limited, it is unlikely that the intake of chia seeds would have an adverse effect on human health. Chia is classified as a food by the Food and Drug Administration (FDA), which implies that it is safe for human consumption. Be aware that I’m providing my personal interpretation. Scholarly articles are very technical and difficult to read for the layman person. I suggest you read the articles yourself and draw your own conclusions. See the bibliography listed at the end of this article for more information. As you can see, the European Commission recommends a daily intake of no more than 15 grams, which is about 2 tablespoons. This requirement does not mean that eating more than 15 grams per day, will be detrimental to your health. What happens is that the opinion was requested based on the purpose of using chia seeds as an ingredient in bread. They anticipated the daily intake, based on the average bread consumption by adults from the UK. Because of the limited toxicological information available, they can’t recommend a higher intake. More research studies are needed to better understand the possible adverse effects of chia seeds consumption. There is not enough toxicological research supporting the idea that chia seeds can be bad for you, as it was pointed out in the forum discussion I stumbled upon. There is information that supports that chia seeds can be beneficial for your health and for the improvement of certain medical conditions. However, the intake amount can be an important factor. The European Commission suggest a daily intake of no more that 15 grams. My opinion is that consuming more than 15 grams won’t harm you either but you should use your common sense, everything in excess can certainly harm you, sugar and salt are good examples. It is also recommended to consume chia with liquids. Eating substantial amounts of chia without sufficient fluids can cause stomach cramps. If you experience stomac cramps, just drink more water or eat less chia. Tentens, Inge (2009). Opinion on the safety of Chia seeds (Salvia hispanica L.) and ground whole Chia seeds as a food ingredient. European Food Safety Authority. Vuksan, V., Choleva, L. (2011). The Effect of Salvia hispanica L. (Salba) on Weight Loss in Overweight and Obese Individuals with Type 2 Diabetes Mellitus. Unpublished master’s thesis. Nutritional Sciences University of Toronto. Glutenolgy - Healthy Recipes for the Gluten Free Warrior. 146 mouth watering recipes to help you easily get started on a gluten free diet.